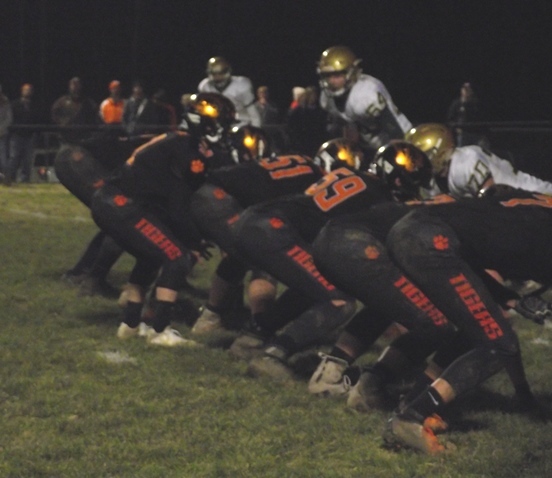 STRATFORD – In a WIAA Level 2 football playoff game that looked pretty good on paper, quickly got out of hand as Stratford scored four first-half touchdowns and rolled to a 48-0 victory in a Division 6 matchup with Colby on Friday night at Tiger Stadium. Both teams came into the contest with identical 8-2 record. The Tigers had lost to Spencer/Columbus on opening night and in a squeaker to neighboring powerhouse Edgar in the last regular-season game. The Hornets too had lost to the Rockets and to Cloverbelt champ Eau Claire Regis, who has its share of state tournament appearances. So, while this did look like it might be a battle, it was soon obvious that the Stratford defense wasn’t about to yield a darn thing. After Colby went three-and-out on its opening drive, the Tigers wasted little time marching 53 yards in just five plays. Chase Flink went the final 5 yards and when Reed Curtis kicked the PAT, the Tigers were up 7-0. The only missteps for Stratford came in opening quarter when it fumbled on their second possession and were intercepted on its third. Both mishaps were negated by a defense that refused to give an inch. Colby didn’t get a first down until the 8:50 mark of the fourth quarter. They had minus-26 yards total offense in the first half and finished with just seven yards passing. The Hornets did gain 49 yards on their final drive against a Stratford defense that definitely did not start the game. The Hornets finished with just 33 yards total offense. And the Tigers defense scored three times, beginning when Eli Drexler stepped in front of a Roman Schmitt pass with 1:11 left in the first quarter and ran it in from 35 yards to put the Tigers up 13-0. Kade Ehrike, who rushed 13 times for 153 yards had a pair of TDs in the second quarter, got in from the 16 at the 6:26 mark and from the 6 with 1:56 left in the half as the Tigers went into the break ahead 28-0. Drexler got in the end zone again at the beginning of the third quarter from 5 yards out. The PAT was good and at 35-0 the running clock began. The Tigers defense stayed focused and when the Hornets left it on the ground with 8:48 in the third, defensive tackle Jaykob Mickelson scooped it up at the 19 and scored a little later. The defense pulled off the hat-trick when it scored for the third time halfway through the fourth quarter as Max Vanderhoof stepped in from of a Schmitt pass and took it 37 yards to make it 48-0. Stratford (9-2) will have to hit the road for the first time in the WIAA playoffs next Friday, Nov. 2, when it will play at No. 1 seed Kewaunee (11-0) at 7 p.m. in a Division 5 Level 3 state quarterfinal. The winner will take on the winner of Spencer/Columbus (10-1) and Westby (10-1) in a Division 6 state semifinal on Nov. 9 or 10. S – Chase Flink 5 run (Reed Curtis kick), 8:24. S – Eli Drexler 35 interception return (run failed), 1:11. S -Kade Ehrike 16 run (Curtis kick), 6:26. S – Ehrike 6 run (Max Schwabe run), 1:56. S – Drexler 5 run (Curtis kick), 9:37. S – Jaykob Mikelson 19 fumble return (Hunter Austin kick), 8:48. S – Max Vanderhoof 37 interception return (kick failed), 7:32. First downs: Colby 5; Stratford 15. Rushing (att.-yards): Colby 36-26; Stratford 28-246. Passing (comp.-att.-yards-int. ): Colby 2-7-7-1; Stratford 8-12-123-1. Penalties (no.-yards): Colby 2-8; Stratford 5-40. Fumbles (total-lost): Colby 1-1; Stratford 1-1. Rushing: C, Carter Grewe 3-16, Lucas Karl 3-16, Reece Kelnhofer 8-14, Gavino Lopez 3-12, Tyler Klement 8-minus 5, Roman Schmitt 7-minus 30. S, Ehrike 13-153, Flink 5-59, Drexler 7-24, Devin Dennee 2-11, Chandler Schmidt 1-4. Passing: C, Schmitt 2-7-7-1. S, Schwabe 7-8-108-1, Schmidt 1-4-15-0. Receiving: C, Isaac Karl 1-7, Klement 1-0. S, Flink 2-44, Ehrike 2-38, Vaughn Breit 2-28, Beau Gross 1-11, Drexler 1-2. Fumble recoveries (defense): C, Harley Schmelzer. M, Mikelson. Interceptions (defense): C, I. Karl. S, Drexler, Vanderhoof. Records: Colby 8-3; Stratford 9-2. Steve Pilz writes for MarshfieldAreaSports.com, a contributor to focusonmarshfield.com.